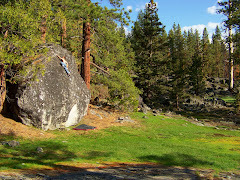 After a bit of work in Los Angeles area for a while, the backpack bouldering was back on. I spent 3 days out in Desolation wilderness dipping into an old spot of mine from back in 2005. I went alone and packed in about 60 lbs of gear including stove, fuel, pots and pan, crash pad, climbing stuff, 3 days of food, tent, sleeping bag and camera. The hike was 6 miles with about 3000 ft elevation gain to get to this spot. The serenity out there was amazing. A place that's worth hiking that far has got to be good. I set up an amazing camp right near the lake. Waking up with the sun and hitting the hay as it went down. Everyday was great. Wake up, breakfast and coffee, and then after a little warm up, I was tapping into the potential of this mystical zone with spectacular scenery. The air temperature up there at 9000 + feet was nice and cool. The area had its own unique character of clean white granite with dark chocolate chip- like xenoliths for holds. It was like nature sculpted its own climbing gym and then gave it one hell of an approach. While there I sent about 10 new lines I had never climbed before. They were all very good and creative. I had to choose my problems carefully. When you're alone, 6 miles out with one crash pad and no one around for miles you have to pick your battles. So for the most part I stuck kinda low to the ground. With more pads this place had some amazing highball potential. Back in 2005, I took several day trips to this same area working this awesome roof project. After 5 days of assault, I did the first ascent and named it Cowabunga. Back then it was a problem at my absolute limit. I gave it the v10 grade. On this trip I revisited this climb and was able to repeat it again for the camera after about an hour. It was nostalgic to climb on this sick problem and remember the time when I first did the FA. What a rightous trip. And, with over 63,000 acres of wilderness, most of it holding rock, there's no telling what else lies in Desolation. It's an inspiring place. I feel gratefull for the priveledge to be able to explore this great area. What a gift.